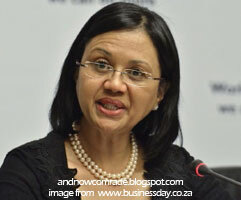 Tina Joemat-Pettersson Too Busy or Too Lazy? Tina Joemat-Pettersson, South Africa's Minister of Agriculture, Forestry and Fisheries told parliament yesterday May 07 2012 she could not possibly meet with all the agricultural organisations in south Africa as there were too many (around 550) because she would have to work every day of the year for 5 years to do so! Well Minister, that's what we (the taxpayers) pay you to do. We do not pay you to drive around the country in luxury vehicles, fly all over the place, stay in expensive houses and up-market hotels when you are travelling for business. It's part of your job. If it's to much work for you, resign and let someone who is not so bloody lazy take over (if there is any member of your party that actually knows what the concept "Work Ethic" means). Your department, Agriculture, Forestry and Fisheries is a disaster. Although you have not been the minister for long and have inherited a corrupt and ineffective mantle from your pre-predecessors', the problems faced by Agriculture, Forestry and Fisheries in South Africa are a threat to the well being of this nation. Since your party (ANC) came to power in 1994, South Africa has lost half of it's farmers. (from over 100 000 in 1994 to approximately 60 000 today.) These farmers have left this country whose rulers are openly hostile to them to move to foreign lands who value and appreciate their knowledge and experience, while your party blithely continues to threaten food security with idealistic racialist concepts of black empowerment and land re-distribution. Fisheries can only be described as iniquitous... the act passed in 1998 denied the entire East Coast fishing community their constitutional right to make a living. West Coast fishermen were forced into selling their rights simply to buy a licence to make a living. The current proposed Small Scale Fisheries bill addresses only the plight of West Coast Fishing communities in a bid once again to garner "coloured" votes for the ANC in 2014.